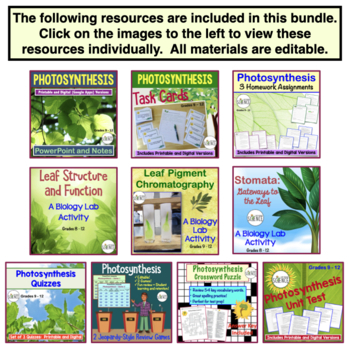 Photosynthesis Complete Unit Plan Teaching Bundle. 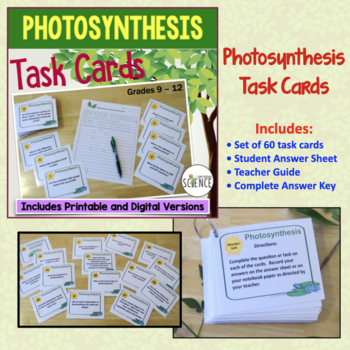 It's all here.... Everything you need to teach this complete unit on photosynthesis to your biology students. This bundled unit contains at least 2 weeks of teaching materials or 3 weeks if you complete all of the enclosed labs. 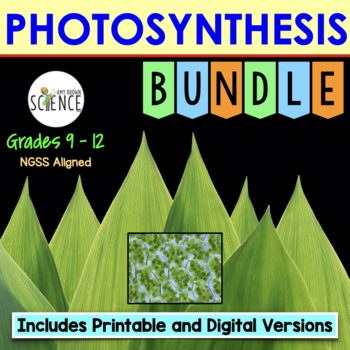 This photosynthesis bundle covers all topics related to chloroplasts, pigments, light dependent reaction, light independent reaction, and energy transfers. For Even Greater Savings: This complete unit bundle is included in the following MEGA - Bundles. Click the links below to view these bundles. What is included in this unit? • A Teacher Guide that offers tips for implementation, suggestions for sequencing, and alignment to NGSS standards. When appropriate, I have included each product as an editable Word document, and I have also included each product in pdf form. Each of these products is sold separately in my TpT store, but buying the entire unit in one download will save you money. If each of these products were purchased separately, the total cost would be $38.48. This bundle is priced at $28.75, which is a 25% discount. • Autotrophs, heterotrophs, and the flow of energy through an ecosystem. • Structure of the Chloroplast: Students will label a drawing and define outer membrane, inner membrane, thylakoids, grana, stroma, chlorophyll, photosystems. • Electron carriers: Short discussion on electrons, energy levels of electrons, excited electrons, electron transport chain, NADP+, NADPH. 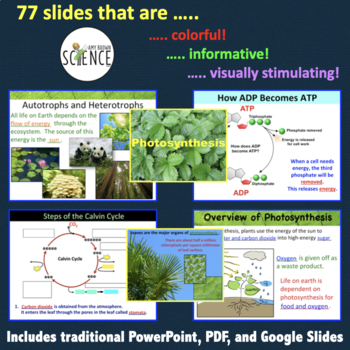 • An overview of the stages of photosynthesis: The light dependent reactions and light independent reactions. Includes an equation for photosynthesis that outlines the reactants and the products of photosynthesis. • Factors affecting the rate of photosynthesis: water, temperature, light intensity.